Surfing in Germany has always been and probably will always be something exotic! This is mainly due to the fact that the German North Sea coast is a unique phenomenon, the so called "Wattenmeer" which is at low- tide a muddy 30 km wide beach-like stretch in front of the coast, that doesn´t allow swell to hit. The only place where acceptable waves are to be had are the islands, which are positioned at the end of the Wattenmeer and can only be reached by long and expensive ferry rides(sometimes they make you pay for your board as well). The Baltic Sea gets some waves, but not as frequent as the North Sea, and smaller. Nevertheless for surfers from Hamburg and north Germany in general, good spots in Denmark are only a 4 hours ride and definitely worth a weekend or day trip on a good swell. 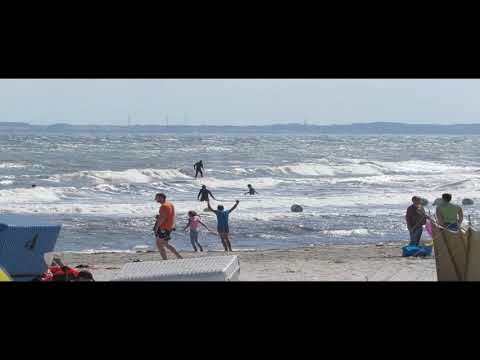 Surfers from the western metropolitan area "Ruhrpott" even have acceptable surf in 2+ hours reach at the dutch coast. The rest of Germany had better move! without rope - was really good trip, best time for this spot is spring, when the snow is melting AND raining at the same time.. yes it is cold but the wave works without a rope. surfing Rostock - Hi moving to Berlin in the next month and need to find the closest wave so i dont go too insane. will be going to Rostock on a regular basis.Any waves there??? surfing wustrow? - planning to surf beginning of september in wustrow, anyone any experiences there? bad or really bad?what equipment to recommend?